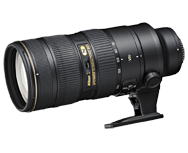 Does Nikon&rsquo;s latest professional 70-200mm justify its price? Nikon’s mid-term refresh of the firm’s hugely popular D800 and D800E models resulted in a single model, the D810. Like the D800E it aims to maximize the resolution of the full-frame 36-Mpix CMOS sensor and omits a modified AA filter completely. We’ve analyzed the image quality of over 100 different lenses mounted to the new camera to discover how well this new model performs. Following on from the lens recommendations for the earlier full-frame Nikon D600, we’ve now had the opportunity to assess a wide range lenses with that model’s replacement, the 24-Mpix D610. We’ve analyzed a total of 95 Nikkor and third-party prime and zoom models with the D610 to assess image quality, and we’ve come across some unexpected results. Read onto find out more about that and which lenses perform best when paired with the camera.